Funny old game politics. In Britain at the moment we have a multitude of problems. Our economy is static. Our public services are declining and will decline further as budget cuts take effect. Our budget deficit, despite the cuts, is rising – as is unemployment. We have restructured our employment away from solid, stable, full-time jobs, protected by a minimum wage, towards lighter-regulated and often part-time jobs which are cheaper for employers. We have a ticking time-bomb of an ageing population, living longer but with much less certainty as to how their old age will be funded. At the other end of the age range we have school-leavers without jobs but who cannot afford the further education that might make them employable. Our city centres are all-too often at night the scene of drunkenness and disorder. We have the widest divisions in living memory between the “haves” and the “have-nots” – and the variation in affluence between the more prosperous South (especially London ) and the rest of the country is large and widening. We have an education policy which seeks to create a small number (relatively) of elite State schools whilst ignoring the all too many “bog-standard” Comprehensives. We have a bombardment of advertising from huge gambling companies that dangle the prospect of casino winnings at gullible punters who all too often can’t really afford to lose. There is a palpable sense of unease and a search for scapegoats. The scapegoats of choice are not employers many of whom increasingly see labour as just another factor of production to be hired and fired at will. They are not parents who are so busy, often, working to make ends meet that they cannot devote enough time to ensuing their children are a credit too them. The are not the over-burdened and often underpaid public servants whose hands are tied by funding shortages. No – the scapegoats are the bureaucrats of the European Union and immigrants, often from Eastern Europe, who “take our jobs” or “come to sponge off welfare and the Health Service”. Elements of the Right Wing press, like the Daily Express and the Daily Mail, stir up this prejudice with absurd stories and mendacious headlines. The scapegoats are the principle targets of the “UK Independence Party” (UKIP) whose appeal is to those who (a) Feel something must be done (b) Seek to find someone to blame. Because Gordon Brown’s Labour government was seen by these people to have failed Labour for them is not an option (and the Labour leader Ed Miliband has failed to impress). Because the LibDems are in the Coalition they can’t be relied upon either. And the Conservatives are beyond the pale because of their economic failures and (cue blame culture gut response) their continued kow-towing to Brussels and inability to control immigration. Remember these are perceptions, and the truth is different. But perceptions ARE reality because people believe them to be true. 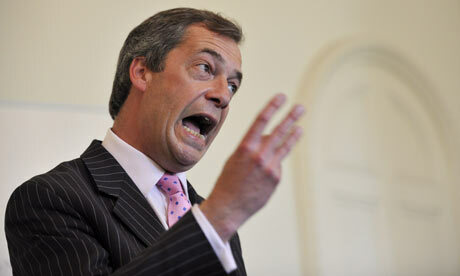 Enter UKIP leader Mr Farage (pictured). He doesn’t ask you to understand complex subjects and he’s no policy wonk. He doesn’t ask you to be balanced in your political judgement. Or fair. Or even well-informed. He just wants you to believe that all of our malaise can be reduced to the simplest of policy proposals, and he knows that these proposals will hit the spot of your prejudice and your search for the guilty. 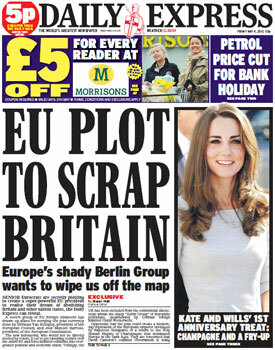 The EU is to blame? Lets get out. Immigrants are taking our jobs? Stop them coming. And so on. That politics is complex and that it is the art of the possible? Well that doesn’t worry our Nigel. UKIP is a protest movement masquerading as a political party. It is the ultimate “none of the above” option. It is not an ideology and it is not a serious option. It’s proposals are uncosted and the dreadful implications attached to its mainstream positions have been inadequately challenged by the main parties. UKIP will fade away sooner rather than later. In the meantime it can do untold damage to our political system and the core principles we hold dear. Whilst UKIP is at the wilder fringes of reason the Right Wing of the Conservative party is not far removed. Quite why at a time of maximum difficulty for their Prime Minister they would seek to challenge him and destabilise an already shaky party you would need deep psychiatric analysis to find out. These “Eurosceptics”, emboldened by the rise of UKIP, see a real possibility to make progresswith their inward-looking and unashamedly nationalist agenda. This is not a small awkward pressure group in the Party. They probably count a majority of Members of Parliament as adherents to their cause- and quite a few Cabinet Ministers as well. But the paradox of their actions in calling for an early referendum on the UK’s EU membership is that the route they are taking will almost certainly ensure that such a referendum won’t happen. The two main opposition parties (Labour and the LibDems) are against a referendum. UKIP is of course for – but despite their strength in the opinion polls they have little or no chance of getting even one Member of Parliamentat the next General Election. There are four possible outcomes to General Election due in 2015. (1) Tory overall majority (2) Tory/LibDem Coalition (3) Labour/LibDem Coalition (4) Labour overall majority. Of these only (1) could conceivably deliver an EU referendum. But the Conservatives have little chance of securing an overall majority – not because their EU Referendum call does not have popular appeal but because it is not by any means the most serious of issues that the public is worried about. I listed some of theses issues in the first paragraph of this piece. These are the problems on which voters will be voting. And it is the Coalition’s pretty poor record, and the Prime Minister’s personal failings, that will almost certainly guarantee that we won’t have the Conservatives governing on their own (or at all) after 2015. So all the sound and fury over an EU referendum is much ado about nothing. And demeaning to our political system and our standing in the world. 1 user commented in " Much ado about nothing – the ludicrous political furore about a referendum on the UK’s EU membership "
Mr Briggs, with respect it is hypocrisy to suggest that Nigel Farage and UKIP are simply scapegoating the EU for everything that is declining or stagnating in the UK. You accuse Farage of “just wanting you to believe that all of our malaise can be reduced to the simplest of policy proposals” yet your accusation is in itself misrepresenting the case for leaving the EU, reducing it to pure nationalism. Nigel Clegg had two hours to put the informed, rational case for staying within the EU forward on national TV yet virtually every time he attempted to use facts and figures they were either outright lies or gross distortions. Why, if the case is so strong did he have to resort to this, and ‘scaremongering’ which he had the nerve to accuse Farage of? Why even speculate on what the outcome of leaving the EU would be when we have examples of countries which have done just that to use as a reference; we both know why he didn’t use Switzerland’s example to demonstrate the Dooms Day scenario don’t we? The Swiss clearly demonstrate how leaving the Eu does not lead to the collapse of trade with the EU. In 2012, 56% of Swiss exports went to the EU, and 75% of its imports came from there, so whilst an active policy on the European Union is essential, full membership is not; Switzerland is not a member state of the European Union; instead it conducts its relations with the EU on the basis of bilateral sector agreements. Personally I realise that virtually the whole planet suffered a recession, so blaming immigration or the EU is irrational. Besides, UKIP are not against immigration and are not anti-European, these are the misrepresentations promoted by the Europhiles to reinforce the ‘Little Englander’, nationalist characterization. This is like saying that I have something against my next door neighbour just because I don’t want to pay him part of my wage and give him influence on how I spend my money. As it is we lend each other tools now and again and give each other a hand doing jobs. Never has there been any cause to fall out, never has there been any problem with us both having total autonomy and no signed agreements. Indeed, if we did sign any contract this could become a source unease and even conflict if we both fell upon hard times and we had different priorities when it came to allocating funds. In Australia, those wishing to migrate there have to fulfill certain criteria using a points system, and if a prospective individual has certain skills or a job placement they will qualify for entry. They’re not anti-immigration, they simply control immigration. Would you turn the bath tap on with the plug in and leave the house to go shopping, and if not does this mean you’re ‘anti-water’? Would you turn the central heating up to full blast and sit there sweating in the Summer because you want to be seen as ‘pro-heat’? Would you hand part of your wage over to your neighbour and give him a say in how you lived your life, and have the right to opt out of this arrangement removed from you? Would this arrangement promote peace between you and your neighbour, and goodwill, and would you be unable to cooperate and be a good neighbour without such an arrangement? In conclusion, the case to leave the EU is perfectly rational and can be made without jingoism or nationalism, both on a purely economic level and on a social, political level. To speculate on the UK’s role outside of the EU, rather than scaremonger you should simply look at nations outside of the EU and how their economies are performing.